When interval methods handle systems of equations over the reals, two main types of filtering/contraction algorithms are used to reduce the search space. When the system is well-constrained, interval Newton algorithms behave like a global constraint over the whole n ×n system. 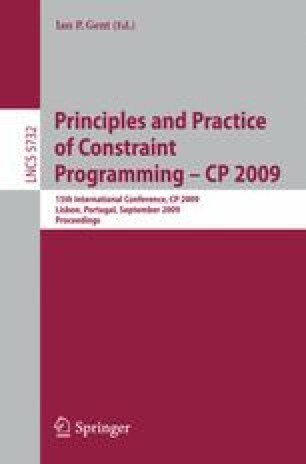 Also, filtering algorithms issued from constraint programming perform an AC3-like propagation loop, where the constraints are iteratively handled one by one by a revise procedure. Applying a revise procedure amounts in contracting a 1 ×1 subsystem. This paper investigates the possibility of defining contracting well-constrained subsystems of size k (1 ≤ k ≤ n). We theoretically define the Box-k-consistency as a generalization of the state-of-the-art Box-consistency. Well-constrained subsystems act as global constraints that can bring additional filtering w.r.t. interval Newton and 1 ×1 standard subsystems. Also, the filtering performed inside a subsystem allows the solving process to learn interesting multi-dimensional branching points, i.e., to bisect several variable domains simultaneously. Experiments highlight gains in CPU time w.r.t. state-of-the-art algorithms on decomposed and structured systems.